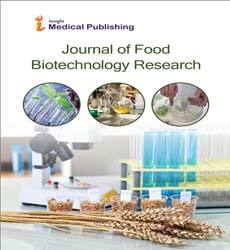 The Journal of “Food Biotechnology Research” is an international, peer-reviewed open accesses journal dedicated to discuss the current developments and applications of modern genetics, enzymatic, metabolic and systems-based biochemical processes in food and food-related biological systems. The intention is to improve food, food ingredients, and functional food at the processing stage, beyond the agricultural production. Other areas of strong interest to this journal include microbial and fermentation based metabolic processing to improve food for health, metabolic basis for food ingredients with health benefits, and biochemical processes for food waste remediation. Researchers in agriculture, food science and nutrition, including food and biotechnology consultants around the world will benefit from the research published in Food Biotechnology research journal. The journal covers a wide spectrum of topics in this field including, Crop Biotechnology, Animal Biotechnology, Food Science, Nutrition, Food Biotechnology, Biochemical and Bioprocess Engineering, Metabolic and Genetic Engineering in Food Science, Food Microbiology, Nano-biotechnology in Food Science and Technology, Biopolymers as Food Packaging Materials, Role of Microorganisms in Waste Treatment of Food Industries etc. The publishes original scientific works as research articles, short communications and reviews about agriculture and food chemistry and biochemistry, food control, evaluation and processing in food science. Articles addressing modern molecular, metabolic and biochemical approaches to improving food safety and quality are equally encouraged. All articles are peer reviewed and published under the guidance of our Editorial Board members. Functional foods are foods that deliver additional or enhanced benefits over and above their basic nutritional value and have a potentially positive effect on health. Some functional foods say they promote optimal health and help reduce the risk of disease; a familiar example of a functional food is prebiotics, or plant stanols and sterols, Functional foods are usually similar to foods that are consumed as part of our usual diet e.g. yogurt, drinks, bread. Food Biotechnology is focused on emerging developments and applications of modern genetics, enzymatic, metabolic and systems-based biochemical processes in food and food-related biological systems. The goal is to help produce and improve foods, food ingredients, and functional foods at the processing stage and beyond agricultural production, genetically modified plants are used to enhance taste, shell life, nutrition and quality of food, genetically modified food is synthesized using biotechnological tools. Fermentation is a metabolic process in which an organism converts a carbohydrate, such as starch or a sugar, into an alcohol or an acid, Fermentation is also used more broadly to refer to the bulk growth of microorganisms on a growth medium, often with the goal of producing a specific chemical product. Fermentation is a natural process used to produce wine, beer, yogurt and other products. Green biotechnology deals with the use of environmentally-friendly solutions as an alternate to ancient agriculture, gardening, and animal breeding processes. Associate in Nursing example is that the coming up with of transgenic plants that area unit changed for improved flavour, for accrued resistance to pests and diseases, or for increased growth in adverse climatic conditions. That is often acknowledged plant biotechnology that is applied to agricultural processes manufacture additional environmentally friendly solutions different to ancient industrial agriculture. Enhancing plant traits by traditional methods like cross-pollination, grafting, and cross-breeding is time-consuming. Biotech advances allow for specific changes to be made quickly, on a molecular level through over-expression or deletion of genes, or the introduction of foreign genes. The latter is possible using gene expression control mechanisms such as specific gene promoters and transcription factors, Salient Achievements of Crop Biotechnology Herbicide Tolerant Crop Plants; Engineering for Virus Resistance, Crop plants Resistant to Insect Attack, Resistance to Pathogenic Fungi and Bacteria. Making food unfit for consumption by Clostridium botulinum inclusion in an item used as food, or growth of other harmful microorganisms, There is a broad range of microbiological pathogens, which can cause contamination and thus infections, exotoxin and endotoxin are the toxic by-products of microorganisms. Bacterial infections can mostly be treated with antibiotic drugs. However, there are cases where this is extremely difficult or even impossible because the bacteria have become multidrug resistant. Against most viruses and all prion diseases, there are also no effective drugs available. Thus, prevention of such infections is crucial. Food Science and Technology International,Cereal Chemistry,American Journal of Food Technology, Advances in Food and Nutrition Research, Food Protection Trends,Journal of AOAC International. Nutrition is the science that elucidates the interactions of nutrients and other substances in food. It includes intake of food, considered in relation to the body’s dietary needs. Good nutrition is an adequate, healthy balanced diet combined with regular physical activity , it is a basis for good health. Poor nutrition is insufficient, poorly balanced diet can lead to reduced immunity, causing deficiency diseases like anemia cretinism, kwashiorkor in acute cases, and marasmus in chronic cases of malnutrition.